Explanation of topic "camo values"
Base camo values were hidden by game developers. So they were determined experimentally on the beta-test client. 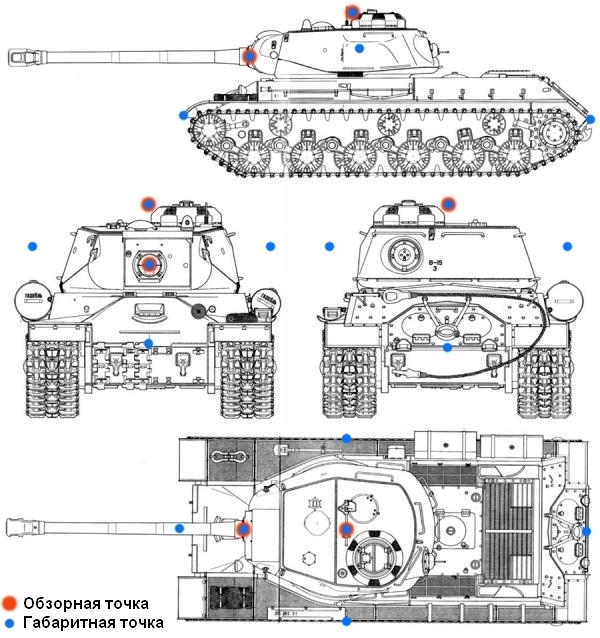 In the overview there are camo values for vehicles with top turrets and top-cannons. According to game developers max spotting distance is 445 meter. But the view range of some vehicles by applying of all bonuses such as skills or equipment could be more than 445 meter. In that case this restriction is still in force, but such vehicles will have better chances to spot enemies withing 445 meters. Also there is a minimal distance of 50 meter. You will always spot enemies, which are closer as 50 meters to you. I think it depends on complexity of spotting-detection algorithm on that distances. Camo values from the overview will be applied to observer's vehicle view capability, reducing his spotting range of a target vehicle. Therefore, it is much more difficult to spot some tank destroyer with camo value of 30 as a Maus tank with camo value of 1,4 on same distance. Each vehicle has several view ports and outer shape points. A vehicle is considered as spotted if there is a line of view from view ports of the observer vehicle to outer shape points of target vehicle, assuming distance (incl. camo value of target vehicle) and bonuses/penalties. Therefore, it is not needed to completely hide a vehicle in a bush, the cannon for example has no shape points and couldn't be spotted by enemy. Overview of view ports and outer shape points. view port on the cannon basement can rotate with a turret. and after each shot immediately. After spot ends, the target vehicle remains visible for 5-10 sec (randomly). Bushes, trees and over obstacles on the map. Some bushes give a camo bonus up to 50%. But after own shot this effect disappears almost completely. All bushes within 15 meters are keeping only 20% of initial camo bonus. This rule applies only for a shooting vehicle, if some other vehicle is staying nearby, it stays hidden. Bonuses of staying and broken trees are equal. it is added to vehicle's base camo value. Camo crew skill. Gives +0,75% camo bonus for each 1% of average crew skill. Commander's bonus increases overall impact on 10% (i.e. +81% to base camo value by 5 crew members). Perks "Brotherhood in arms", vents, consumables increasing overall impact too. Shooting. While shooting the vehicle is loosing almost all of its camo. The impact depends on installed cannon. The rule larger caliber brings larger camo penalties. camo value couldn't be more than 1. The more camo value some vehicle have, the closer distance is needed between observer and this vehicle to spot. Spotting distance is normally smaller as calculated on that formula because of another camo bonuses such as bushes, camo net and others. Для пт сай типа насхорна как все это будет? Я больше не играю в WoT, поэтому прошу слать сообщения об ошибках и пожелания на wotinfo24@gmail.com. Также я принимаю предложения по размещению рекламы.